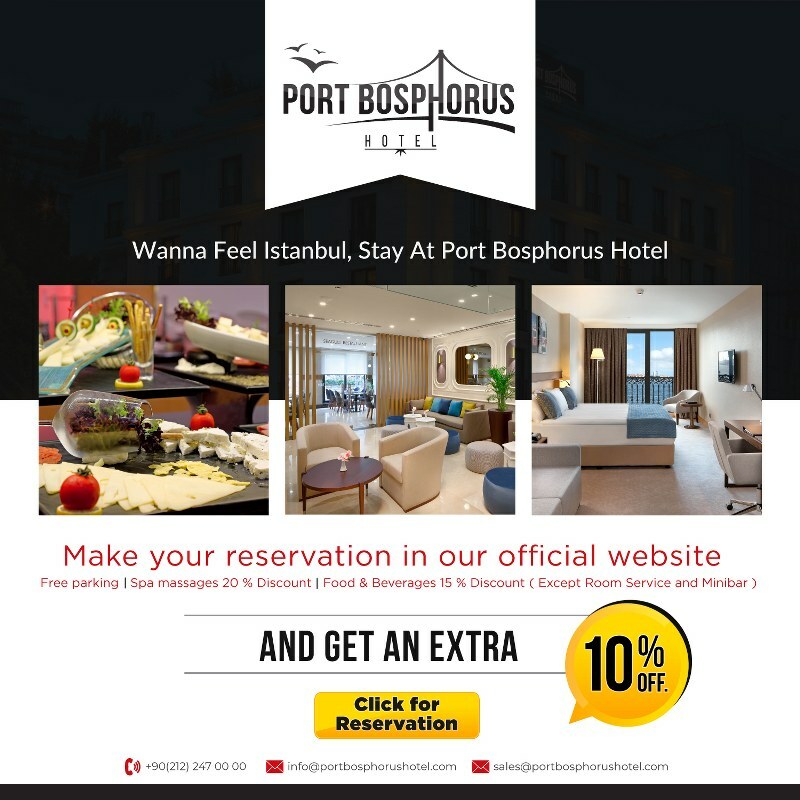 We guarantee getting you the lowest possible rate for your stay with us when you book directly with Port Bopshorus Hotel. In the unexpected case that you find your rooms online at a lower price, we will be happy to meet that rate provided that you contact us within 24 hours of making your booking with us. - Same dates of check-in and check-out. Special membership programs based on coupon codes / vouchers and / or seasonal or last minute sales promotions. A unique and comfortable accommodation experience awaits you in the elegantly designed 23 m2 economical rooms of the Port Bosphorus Hotel. The rooms have no view alternatives. A comfortable accommodation experience awaits you in the elegantly designed 23 m2 standard rooms of the Port Bosphorus Hotel. .
A comfortable accommodation experience awaits you in the elegantly designed 23 m2 standard rooms of the Port Bosphorus Hotel. The rooms have sea view alternatives. A comfortable accommodation experience awaits you in the elegantly designed 28 m2 Classic King rooms of the Port Bosphorus Hotel. A comfortable accommodation experience awaits you in the Port Bosphorus Hotel’s elegantly designed, 35 - 42 m2, Deluxe rooms with great views. A comfortable accommodation experience awaits you in the Port Bosphorus Hotel’s elegantly designed, 35 -42 m2, Deluxe rooms with great views. The rooms have sea view alternatives. A comfortable accommodation experience awaits you in the Port Bosphorus Hotel’s elegantly designed, 23 -m2, Classic Suits with Terrace with indivual terrace .The rooms have bosphorus or sea view alternatives. A comfortable accommodation experience awaits you in the Port Bosphorus Hotel’s elegantly designed, 43m2, Deluxe Suits with Terrace with individual terrace. The rooms have bosphorus or sea view alternatives. A comfortable accommodation experience awaits you in the Port Bosphorus Hotel’s elegantly designed, 40 m2 large (excluding Balcony) and has two standard rooms and there is a door between these rooms. The rooms have no view alternatives. A comfortable accommodation experience awaits you in the Port Bosphorus Hotel’s elegantly designed, 43m2, Corner Suits with Terrace with individual terrace .The rooms have bosphorus or sea view alternatives.